I would like to see a side by side comparison of the various candlestick chart patterns & equivalent bar chart patterns. In other words, what does a Shooting Star look like on a bar chart? The same with a Harami, Dark Cloud, Piercing, Engulfing, Morning Star, etc. No problems at all. Great idea! Many people don't realise it, but candlestick patterns may also be displayed via OHLC Price Bars. The data is exactly the same. It's a great idea to learn to see the sentiment changing in both formats! You'll find the images below. A simple technique for classifying (or naming) candles and gaining a feel for short-term candle sentiment. The importance of context – examining where the current pattern is occurring within the market structure in order to determine the technical and psychological impact of that pattern (how the pattern is interacting with key structural areas and the implications for future market bias). How to apply this to our analysis, bar by bar, through asking whether or not this new information confirms our premise. Let’s wrap up this series of articles with a couple of examples. 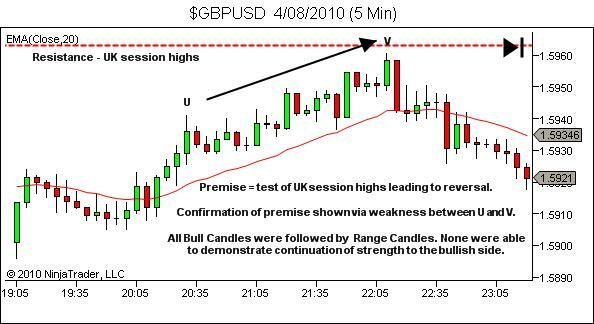 In the example above, the early UK session rallied but was unable to continue higher. The break below the green support line lead to a change of premise. A bearish bias now exists and price is expected to trend lower to the next support area. Any pullback (bullish swings) should confirm weakness. Trend extensions (bearish swings) should confirm strength. Price bar A is a high close range candle, commencing a pullback. As mentioned, our premise is for weakness in any pullback. Weakness shows in candle B (low close bull candle) through the upper tail rejection, as it does through candles C to F which all display variations of range candles. There is no bullish or strong-bullish sentiment displayed throughout this pullback. Our premise is intact throughout the pullback, confirming a higher likelihood of trend continuation than reversal. If our sentiment analysis was being used to identify entry signals as well, a stop entry order (sell) could be placed below the low of the pullback candles. Strength continues in the bearish direction from candle G, once again confirming our premise of trend continuation downwards. Candle H (mid close range candle) shows a pause in the downswing. 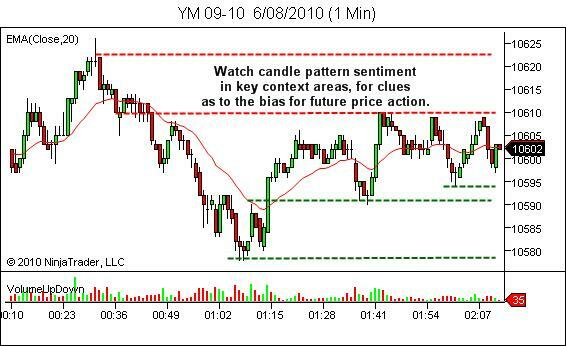 Candle I is a high close bull candle. While considered bullish on its own it actually demonstrates a very weak bullish push when taken in the context of preceding price action. Candle I regained only a small portion of the previous large red candle. The pullback is still showing weakness, which continues through range candles J to M, before again resuming a stronger downwards extension. Bar by bar analysis of sentiment has confirmed weakness in each pullback, confirming our premise for continuation of the trend. This next chart (above) shows a downtrend coming into an area of higher timeframe support. Due to the strength of the move towards support my premise was for a break of the support level, which then fails and reverses into an uptrend. Candle N (mid close range candle) shows the first pause in the downswing. This short-term neutral sentiment is expected coming into support, showing an increase in bullish orderflow. The premise is still intact, for a continuation lower followed by a breakout failure. Candle O (high close range candle) provides no new information. Candle P does however. While a high close range candle displays bullish-neutral sentiment in the short timeframe, considering the context we see we have now rejected a test of support on two occasions. My premise changes tentatively – expecting a test of support which is unable to breach the level, unless I see some evidence of bearish strength. Candles Q, R and S (all range candles) fail to provide any evidence of bearish strength. The premise remains – a test of support before rallying upwards. The rally commences on candle T which shows a high close bull candle closing above the highs of the last six candles. This is strong confirmation of bullish sentiment coming off support. 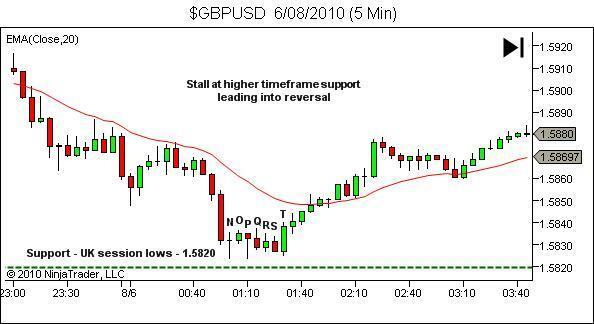 Had our bar by bar analysis been used to identify trade entries, this could be our trigger. 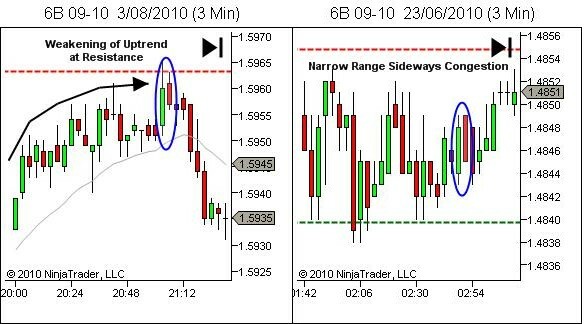 Now, in both of the above examples, you’ll see that we only looked at price action in areas of setups. Our new method of bar-by-bar sentiment analysis not only confirmed our premise but also provided entry triggers (if you wish to use it in that manner). So far, there’s not a lot here that can’t be achieved by normal candlestick analysis. 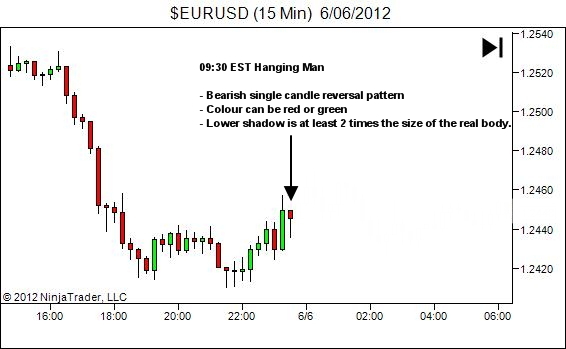 After all, both of the above setup areas can be traded through the usual candlestick pattern methods. 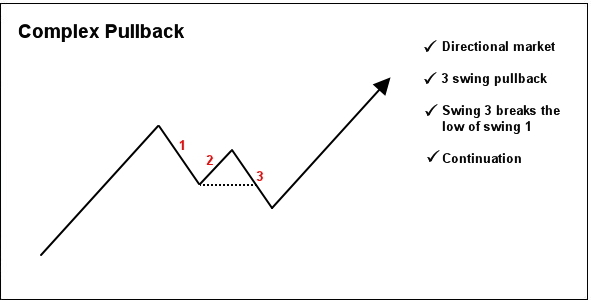 For example, candles B, C and D in the first pullback of chart one show great shooting star candles & gravestone doji patterns, which could be used to trigger the move down. Likewise with the doji and hammer in candle N and P above, which could trigger the move upwards from support in chart two. However, as discussed in the previous articles, the real benefit of bar by bar sentiment analysis is that it allows monitoring of sentiment throughout ALL price action, in order to confirm or alter our premise. So, let’s see how we can use this sentiment analysis method elsewhere, away from setup areas. In the above chart we have a premise of continuation of our trend to the area of resistance shown via the red dashed line. A resistance area is expected to hold unless the price action shows evidence of strength on the move into resistance. Conduct your own analysis of sentiment, bar by bar, from candle U to candle V. You’ll note that price following each bull candle was unable to carry through to close on new highs, forming a range candle on each occurrence. Bulls are not dominating the bears on this rally. There is no sign of strength sufficient to break through resistance. We would therefore be seeking trade opportunity in accordance with this premise – at a test of the resistance area. Three short examples will be insufficient to ensure mastery of this form of bar by bar analysis. Experience should be gained through watching price, initially stepping bar by bar through historical charts, and later through watching price bar by bar with live data. The use of a replay function, if available, will speed learning through faster playback. Does it Support Your Premise? Practice will allow you to gain a valuable analysis skill. One which allows you to remain in sync with the flow of sentiment, feeling the shifting balance of power between the bulls and the bears, and ensure you’re ready to strike when you see opportunity in one of your setup areas. So what? How do we use this information? In order to answer that, let’s step back a bit and consider the purpose of our market analysis. Market analysis has nothing to do with trading. It’s not about trade setups, entry or exit. They come later. Our market analysis process is a tool for developing and maintaining situational awareness. It is a means of understanding the current environment within which we will be trading (structural S/R and trend) and projecting that forward in time to identify likely future price action (through assessment of strength and weakness within the current trend, likely areas of interaction with S/R barriers, and how other traders will likely act upon the human fear and greed caused by price interaction with those areas of S/R). It’s about identifying scenarios for future price movement. It’s not prediction; at least not in the way that most people define prediction which involves a feeling of certainty of outcome. It is probabilities based. Considering probable future price action; considering how ongoing price will have to behave in order to validate our expectation; and where that would provide trade opportunity. Considering also, how price would behave if it was to invalidate our expectation. This way, if we’re wrong, we’ll very quickly know it and be able to adjust our expectations for future market direction. Most traders are reactionary. Surprised by price action developments, they chase setups and entries after they’ve become obvious to the crowd. Through our analysis process, we ensure our awareness is maintained ahead of current market action, so that our trading involves deliberate and premeditated actions rather than impulsive reactions to unexpected events. The ‘YTC Price Action Trader‘ book has well over a hundred pages discussing the process of analysis; and that’s even before getting started on strategy. We’re not going to cover it here. What we will talk about briefly though is a component of the process of ongoing analysis. Bar by bar reassessment of our future price expectations as new candles appear on the RHS of our screen. Assuming we already have in place an expectation of future price direction and areas of future trade opportunity, ongoing analysis is simply a process of asking whether or not the new information still supports this premise. Does it Support My Premise? What does this mean with respect to the sentiment of the pattern and the potential future price action? Does the current price action and sentiment support our previous expectations for future price action? Yes – await further price information. No – decide whether to hold for the next candle, or to reconsider your expectations from first principles. Unsure – just wait for further price information. Following this simple process will ensure we remain focused on price, maintaining our feel for market bias, and ready for action when price gets to our areas of trade opportunity. In parts 1 and 2 of this short article series we discovered a technique for determining the short-term sentiment displayed by any sequence of candles. It’s time now to consider the context. ‘Consider the context’ means we consider where the current price pattern appears with respect to the background market environment and price action, and what that means. The same pattern can have numerous meanings, depending on where it occurs in the market. Referring to the diagram below, we can see that the Low Close Range Candle on the left hand side is occurring after a weakening of an uptrend right into an area of resistance. The first bullish candle broke above recent price action and penetrated the resistance area by a couple of pips before being rejected. Trapped longs will be exiting on any break below this candle. 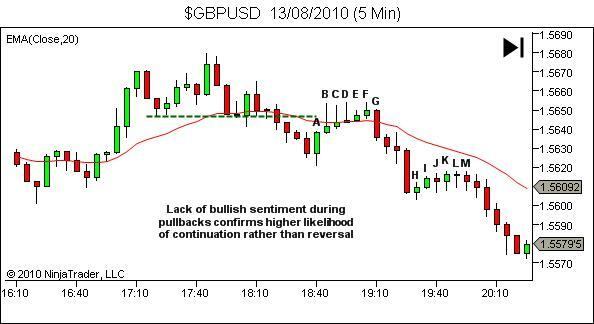 Although a low close range candle is generally considered to display neutral sentiment, when we consider the location of the pattern it has reasonably bearish connotations. Compare that to the low close range candle on the right hand side, which is occurring within the middle of a period of narrow range sideways congestion. The occurrence of this pattern in this location shows absolutely no sign of any potential change to market bias. This is clearly neutral. 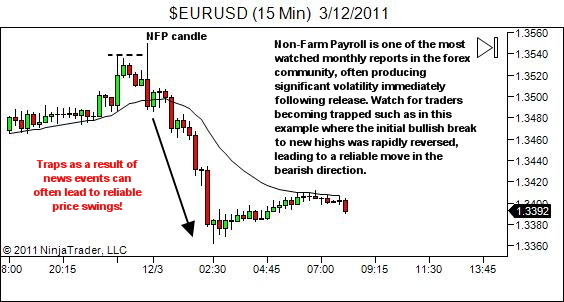 In determining the impact of a candle pattern, you MUST consider where it is occurring on the chart. 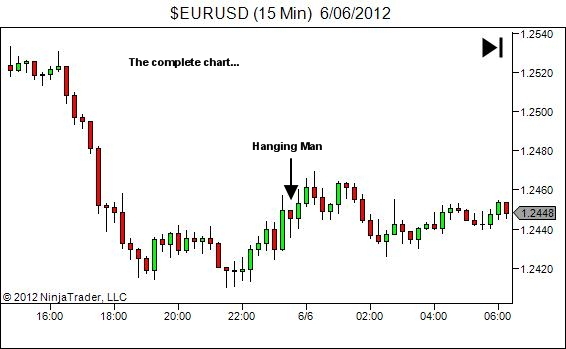 While I monitor all candles as they develop, and the ebook will go into more detail on this process, what we’ll consider here in this article is the most important locations, at which you MUST observe price action. Changes of sentiment at these location can have very significant meaning for future market bias. Where is price in relation to the higher timeframe S/R? Where is it in the trend? Where is it in relation to key swing highs and lows? And what does this mean? Where is the pattern occurring with respect to higher timeframe support and resistance? Has the market shown strength or weakness on approach to the S/R area? Is the current candle pattern sentiment continuing this strength or weakness, or has something changed? Is the pattern showing signs of orderflow opposing the move into S/R, such as tails rejecting price at or near the S/R level? Has the pattern breached the area of S/R? If so, is it now showing signs of acceptance or rejection of this new area? Where is the pattern occurring within the current trend? Is it on an extension? Is it early in the move, or late and overextended? Has it managed to pass the previous swing high/low? Is it on a pullback? Is it early in the move, or has it continued deeper than anticipated? Is it a single swing pullback, or is this pattern a part of a multiple swing retracement. Or is the pattern within a sideways trading range or other form of consolidation pattern? Is price testing any areas of swing highs or lows? Pullbacks to previous areas of swing low support should be watched closely. We expect them to hold. Is the price action showing signs of the level holding, or is it threatening to break? If it breaks, is price showing signs of rejection (opposing orderflow / difficulty continuing) or is price accepting this new area? Pullbacks to previous swing highs (within an uptrend) are not as critical, but should still be watched for their reaction. Extensions are expected to break the previous swing high. Is price action supporting that premise, or is the candle pattern showing weakness. If it can’t exceed the previous swing high, we need to be alert for further signs of weakness which may forecast a complex correction or reversal. Pullbacks to previous areas of swing high resistance should be watched closely. We expect them to hold. Is the price action showing signs of the level holding, or is it threatening to break? If it breaks, is price showing signs of rejection (opposing orderflow / difficulty continuing) or is price accepting this new area? Pullbacks to previous swing lows (within a downtrend) are not as critical, but should still be watched for their reaction. Extensions are expected to break the previous swing low. Is price action supporting that premise, or is the candle pattern showing weakness. If it can’t break the previous swing low, we need to be alert for further signs of weakness which may forecast a complex correction or reversal. Is price testing a range boundary? Has the market shown strength or weakness on approach to the boundary? Is the current candle pattern sentiment continuing this strength or weakness, or has something changed? Is the pattern showing signs of orderflow opposing the move into the range boundary, such as tails rejecting price at or near the level? Has the pattern breached the area of range S/R? If so, is it now showing signs of acceptance or rejection of this new area? Every occurrence of every pattern is unique. By considering the pattern in the context of background structure and price action, we are ultimately attempting to gain a feel for how that pattern will impact upon the strength and weakness of the underlying trend, and how that might influence future orderflow. While many elements of a price pattern can be objectively seen on a chart, determining the influence that pattern will have on future price action is a purely subjective process. You gain that subjective feel through questioning what you see on the charts. In Part 1 of this series, we learnt how to read the Close Position, and define each candle as either a High Close, Mid Close or Low Close candle depending on where the candle closed within its own range. And we saw how the path taken by price within the candle creates slight variations in the degree of bullish/bearish sentiment. We now build on our assessment of current price action sentiment, by considering the current close in the context of the previous candle – allowing us to determine the sentiment of the 2-candle pattern. We define a candle as a Bull Candle, Range Candle or Bear Candle, depending on where price closes with respect to the previous candle’s range. I call this the Close Comparison.